Irish football fans across the land will no doubt still be feeling sore; in the head, heart and body. From the high of last Wednesday’s encounter with Italy, the sealing of the three points that got the national side into the last 16 of Euro 16, to the low of Sunday’s defeat to the host nation, thus ending our participation in the tournament. Yes, being an Irish football fan is an emotional rollercoaster at times and not for the faint of heart. But something significant is changing, both on and off the pitch. On the one hand, supporters can feel heartened by a considerable improvement on the playing front; the fans can be content that with the management team is in place for another few years, and progress can continue to be made. But the other noticeable change has nothing to do with the game and everything to do with image and perception. I’m talking about the players’ wives and girlfriends. The WAGS. Gone seemingly are the days when the antics of the players’ wives and girlfriends were a sideshow to the main event; the expensive shopping trips, the fake tans, the all night partying. It would appear the life partners of our lads are far more sophisticated for all that. In fact, the word ‘WAG ‘may not be used in such a dismissive fashion as perhaps it once did, certainly not if our WAGS have any say in the matter. For years, it seemed that the aspiration of many a young woman was to enter this very exclusive club. By marrying or dating a professional footballer, a life of luxury was theirs, the Gucci bags were standard as was the whiff of Prada left in their wake. Kayleah Adams, wife of Southampton striker Shane Long, is an accomplished handbag designer, who met the Republic star when they were both teenagers while he was playing for Reading. Claire McGeady – wife of Sheffield Wednesday and Everton loanee Aiden – is a successful pharmacist. Helga Simonson, wife of Rotherham’s Stephen Kelly, graduated with a degree in economics and English before achieving a first-class MSC in international business. 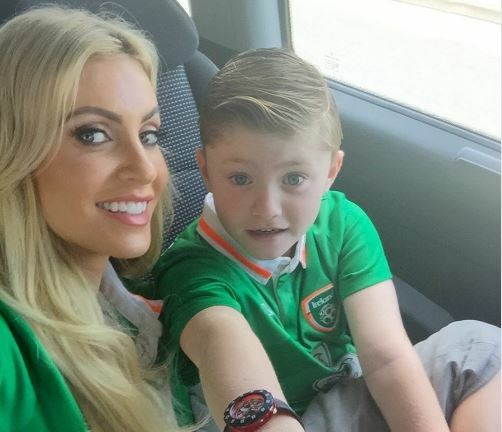 And the uber WAG Claudine Keane, wife of Robbie, pictured above with son Robert, can not only boast a long modelling career, but also a 1st class honours degree in economics and finance from UCD. These Irish ladies have largely shunned the quick and easy publicity that comes with being a footballer’s wife or girlfriend. They are far too busy raising families and building their own careers and have no time to be starring in their own Instagram beach photo album. Irish WAGS have shown that you can be successful in whatever field you choose and there is more to this title than simply basking in the reflective glow of your partner’s sporting fame. Soon the term WAG could be significantly redefined and you can be sure that our team’s WAGs will have played their part.